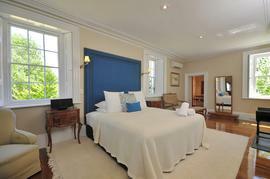 Quamby Estate is a stunning homestead manor with deluxe rooms and suites that will make you feel like royalty. Set on 150 acres of gorgeous lakes, tree-lined laneways and hiking trails, the estate itself has a history of esteemed owners and beautiful Anglo-Indian architecture. Holding true to its origins, you will be impressed by the regal antiques and luxurious touches on every detail. Fishing and golfing equipment are available if you’re feeling adventurous! Live like a king and queen at this magnificent 10 bedroom country-style hotel. Quamby Estate is a charming property dating back to the 1830s and as such your envious living quarters includes stunning Anglo-Indian architecture and period antiques. What makes this property irresistible is the combination of antiques and architecture of another century combined with modern cuisine, entertaining areas and other added luxuries. Previously owned by Sir Richard Dry, Quamby Estate now belongs to Brett Godfrey and Rob Sherrard of Virgin Australia. The appeal is quite obvious with tree-lined laneways, lakes and hiking and bike trails that is part of this gorgeous country property. Set on 64 hectares, Quamby Estate is located 20 minutes drive from the city of Launceston and 25 minutes drive from Launceston Airport. Situated near the historic township of Hagley, Quamby can be reached either via the Bass Highway or Meander Valley Highway between Launceston and Deloraine. Entry to the Estate is along a 1.6km laneway lined by avenues of magnificent hawthorn, poplar and elm trees with gaps between the trees offering a glimpse to the distant Ben Lomond Ranges and the manicured Quamby golf course in the grounds. untouched since planting 150 years ago. The rolling countryside is host to lakes and streams. We strongly advise guests to take out travel insurance to protect you against unexpected changes to their travel plans. In the unfortunate event of a cancellation we require notification via email. A full refund will be provided where such notification is received by us which is 60 days or more prior to the booked arrival date. Cancellations 30 to 60 days prior to the arrival date will incur a cancellation fee of 50% of the total cost. Bookings cancelled less than 30 days prior to the arrival date will forfeit 100% of payment made. 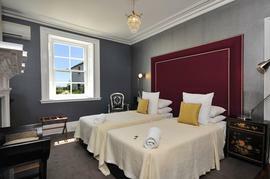 Beautifully renovated deluxe rooms averaging 38m2 in size. King bed or 2 x singles. Flat screen TV, DVD player and DVD library. Free wireless internet, sound system, ipod dock, superior bathroom with spa bath and seperate shower and bathrobes. Air/con, electric heating, iron and ironing board, hairdryer, daily room service including evening turn down. Standard rooms with an average floor space of 15m2 with queen beds, ensuite with shower, hair dryer, daily room service, bottled mineral water, electric heating. 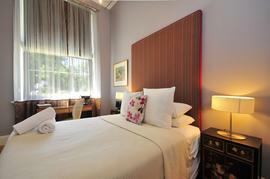 Beautifully renovated Superior rooms averaging 27m2. King bed or 2 singles. Flat screen TV, DVD player and DVDs, free wireless internet, in room sound system & ipod dock,superior bathrooms with bathrobes. Ensuite bathrooms with spa baths and seperate showers. Air/con, iron and ironing board, hairdryer. Daily room service including evening turn down.